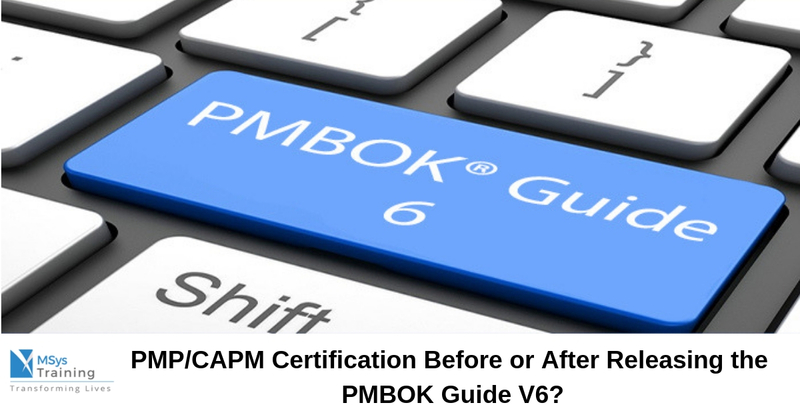 PMP/CAPM Certification Before or After Releasing the PMBOK Guide V6? The PMI published the first edition of the PMBOK® Guide in 1996, and since then it has grown from 176 pages to 589 pages. Since then Project Managers evolved in all departments from the engineering department to the strategic organizational changes. Considering all those facts, the PMBOK® Guide V6 has changed more drastically than ever before. The release of the new PMBOK Guide will bring some major changes to PMP and CAPM certification exam and becoming PMP/CAPM certified will be more challenging for aspirants looking to get certified in 2017 or early 2018. Lack of Study Material: As PMBOK V6 is releasing in the third quarter, instructors and training providers will not get much time to study and prepare the course material. The current resources are based on the 5th edition of the book, and it requires time to get updated according to the latest edition. Increased Difficulty Level: The addition of Agile will increase the difficulty level of PMP/CAPM examination and professionals have to work harder to get certified. Hike in Examination Fee: It has been predicted that the launch of PMBOK Guide 6 might increase the exam fee of PMI certification exams. Change in Exam Format: We can expect changes in the exam format because of changes in knowledge areas and processes. Though the PMBOK Guide is releasing later this month or early next month, we can witness the reflection of it on PMP/CAPM exam from January’ 2018. Professionals who are passionate about their careers and don’t want to delay the career growth, it’s high time for them to schedule the exam with PMI and get certified in 2017.